Rubber flooring is one of the most popular safety flooring choices in the United States. But is it completely safe? We get it: rubber is cool. Rubber flooring comes in many colors and patterns. It’s usually long-lasting and eco-friendly. Most rubber floors are slip-resistant and provide acoustic insulation. But before you sign off on it for your business, there are a few things you should know. Though certain floorings are sold with flame-retardant components, these safer alternatives are far more expensive and color selection may be limited. Over time, exposure to sunlight, heat or certain materials will cause rubber to oxidize and become brittle. Ever seen an old tire left in the sun? Cracks and lesions in the rubber surfacing are inevitable, and your entire floor may have to be replaced. Flaking can also harbor microbes and pests; never something you want to worry about! But while we’re on the subject; be aware that the process of implementing a rubber floor may itself present a problem. Rubber tiles are glued to the base floor and then welded together at the seams. 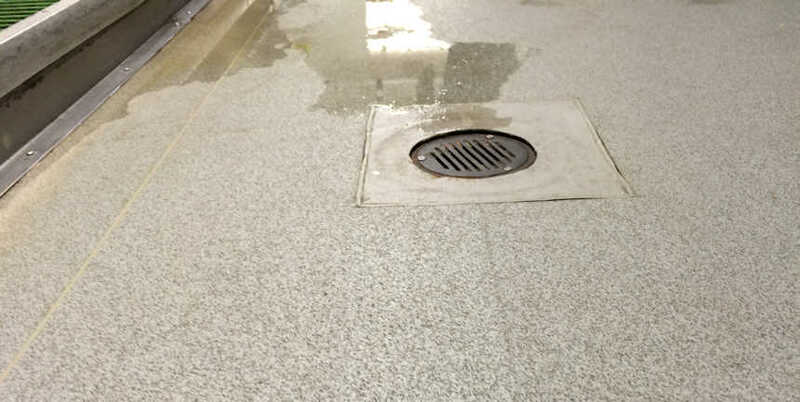 Over time, high traffic, heat, and friction will loosen the seams and allow bacteria and moisture to collect under the tiling. This can cause unpleasant odors, or in extreme cases a full-blown infestation. In the first year after installation a rubber safety floor can trap soil and debris quickly. Before a new rubber floor has time to toughen it is malleable and soft, making it easy for particles to get trapped in the microscopic creases and pores. Yet with all that, it’s difficult to clean. Harsh brushes and scrubbers are a huge no-no for a rubber floor. And certain chemicals or grease spills can corrode it, making it an unsuitable choice for kitchens, bathrooms, or restaurants. Some recycled rubbers give off fumes that pollute the air quality of an indoors area. Chemicals released by aging rubber (both recycled and virgin) may have potential health consequences, especially in low-ventilation areas like gymnasiums, basements, or bathrooms.